In the early 1880s, after the developing grain trade helped Duluth recover from the financial panic of 1873, pioneers and civic leaders Roger Munger and Clinton Markell felt the city’s growing population could support a major theater to attract musical, dramatic, and literary productions. They hired St. Paul architect George Wirth to design the Grand Opera House, which stood at 333 West Superior Street—the northeast corner of Superior and Fourth Avenue West. 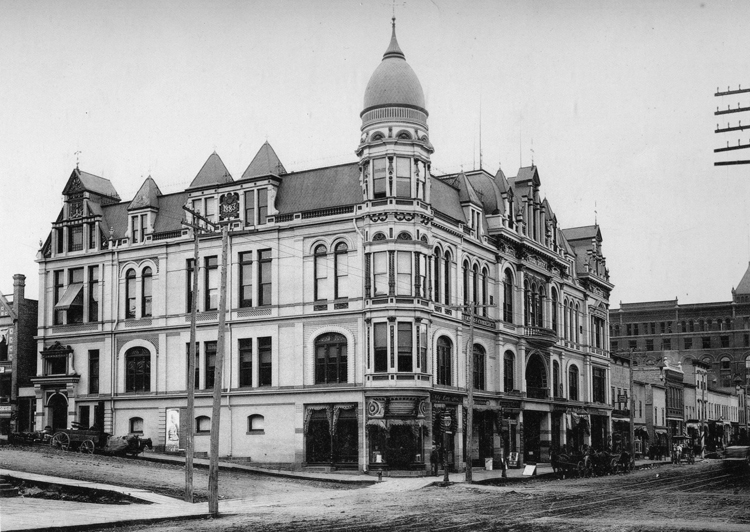 Perhaps the most architecturally adorned building that ever graced Duluth, it would serve Duluth for just six years. The Grand Opera House stood four stories tall and was capped with a Mansard roof executed in several different shades of purple and crowned with iron cresting. Its exterior walls were brick with terracotta and brownstone trim. Its central pavilion along Superior Street featured the grand entrance over which sat an arched balcony and a dome with dormers, columns, and finials. A round tower topped the building’s corner, and the entire building was adorned with a profusion of carved ornamentation. The building was fitted for steam, water, and gas and included a hydraulic elevator. over the upper box a very handsome ‘hood’ in ornamental and gilded iron work reaches to the ceiling. The boxes are enclosed by nickel-plated rails, and draped with maroon silk and blue Turkish satin curtains. Duluthians relished their elegant show place—the Duluth Daily News referred to it as “Duluth’s pride and joy.” In addition to the auditorium, which brought world-class entertainment to Duluth, the Grand Opera House served Duluth in many other ways. It was home to the Chamber of Commerce, the Ladies Literary Library (which would evolve into the Duluth Public Library), a few sleeping rooms, Gasser’s Grocery, several offices (including those of the West Duluth Land Company and Munger and Markell’s Lake Superior Elevator Company) and the Kitchi Gammi Club, which occupied most of the top floor. Only six years after the Grand Opera House opened, a disastrous fire of unknown origin began in Grasser’s Grocery on the bitterly cold night of January 28, 1889. The Duluth Daily News cited fire fighting delays and blunders for allowing it to grow out of control. Fire spread rapidly, leaving the building in ruins. Twelve people were asleep inside, including the janitor and his family. The last one out was A. J. Whitemen, who later became notorious as a forger known as “Jim the Penman.” Then a “handsome” senator, Whiteman was saved when he crawled out of a third-floor window and down a ladder; years later he would be captured by Pinkerton detectives attempting to escape them from his family home in New York by crawling out of a third-story window and down a ladder. The next day the last standing brick wall collapsed, killing Elmer Chamberlain, who was working next door at the book and stationery store he owned with William. S. Albertson. The theater was not rebuilt; the following year the original Phoenix Block was constructed on the site. In 1994, that building was also destroyed by fire; the building that replaced it is also called the Phoenix Block. It wasn’t long before Duluth had two grand theaters to replace the Opera House: The Temple Opera House and the Lyceum Theatre.